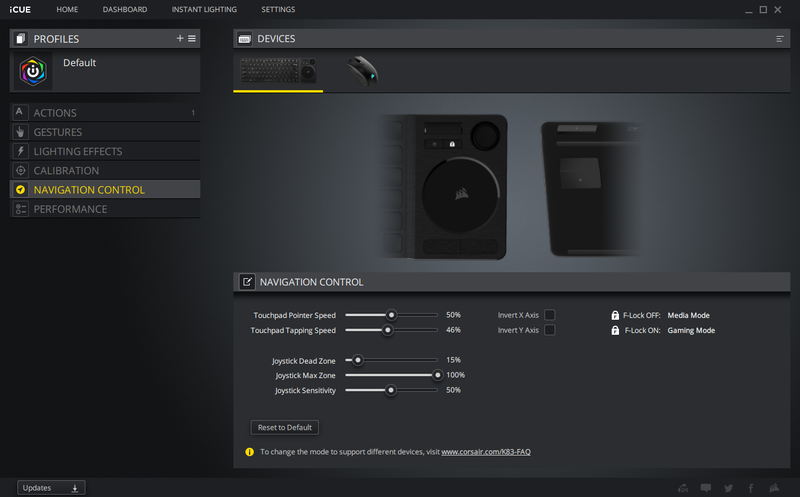 Corsair’s iCUE software package is a powerful multi-device command centre with system monitoring built in too. Note that the below only applies when using the K83 Wireless with a Windows 10 PC over the 2.4GHz connection. The software is currently in open beta for macOS, but this wasn’t tested, and there’s no Linux version either. Bluetooth connectivity is also not compatible with iCUE. If you head into the device settings you can enable the 100 percent backlight brightness. 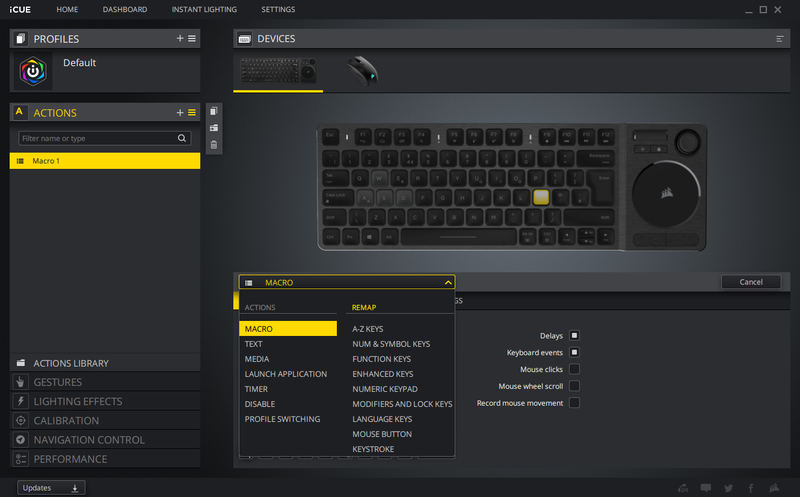 You can also configure LED and keyboard shutoff periods and enable gesture customisation, which I’ll come to shortly. On the main tab you have a series of sub-menus once you’ve selected your device. The first is Profiles, which is where you can manage cross-device customisation profiles. The K83 has no onboard profiles, so all customisations rely on software. Within the Actions tab you can assign custom functions to virtually every key. 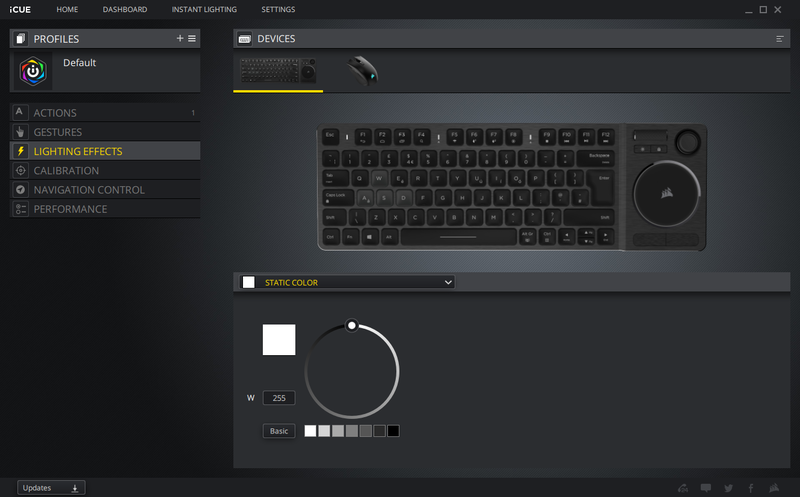 Corsair has this mastered at this stage thanks to expertise in the gaming arena, and the combination of menus and keymap is intuitive. Options include macros, timers, application shortcuts, and more, so it’s comprehensive and powerful. 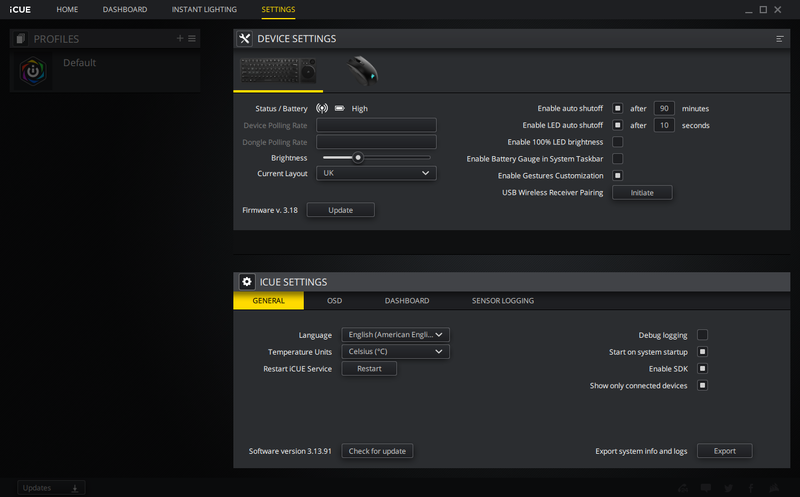 You can even customise what different gestures on the touchpad do, a feature I really like. Four-finger gestures are particularly ripe for assigning, because up/down swipes have no default function and left/right relate to virtual desktop switching which not many people will use habitually. Lighting customisation is basic; you can set static or pulse and set the white level. It hardly needs more than that, though. 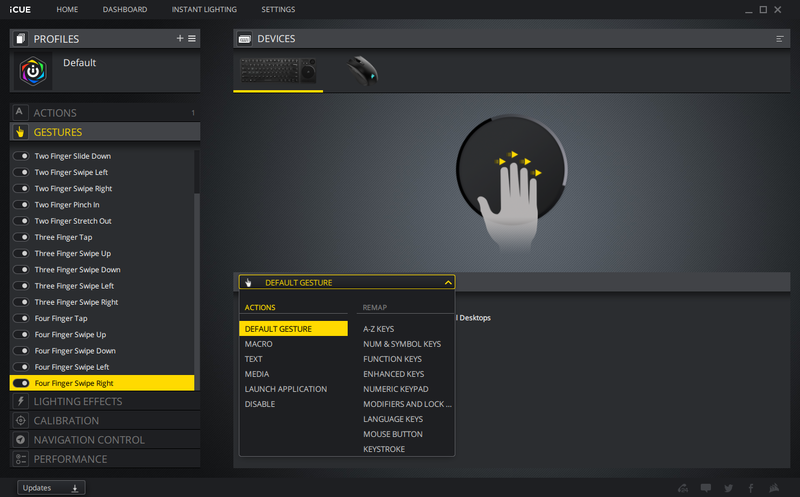 Navigation Control is simple to understand and lets you configure touchpad and joystick tracking capabilities to suit your preference. Lastly, the Performance tab simply controls what happens when you engage the Windows lock (also called F-Lock), with the ability to disable the touchpad altogether, for example. You can even disable wireless encryption, as it adds a 0.1ms or so delay to the response time, but I’d advise against this. 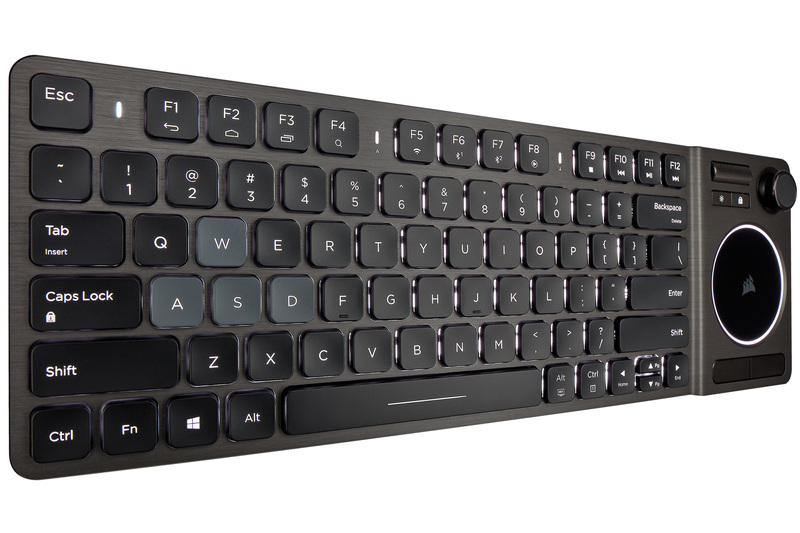 I haven’t tested Logitech’s model, but to me the K83 does everything I would want it to and more. The broad compatibility, triple-device connectivity, gesture customisation, and dedicated menu navigation section mean the K83 is a brilliant device for engaging with swathes of entertainment without ever having to get off your arse. What a time to be alive! 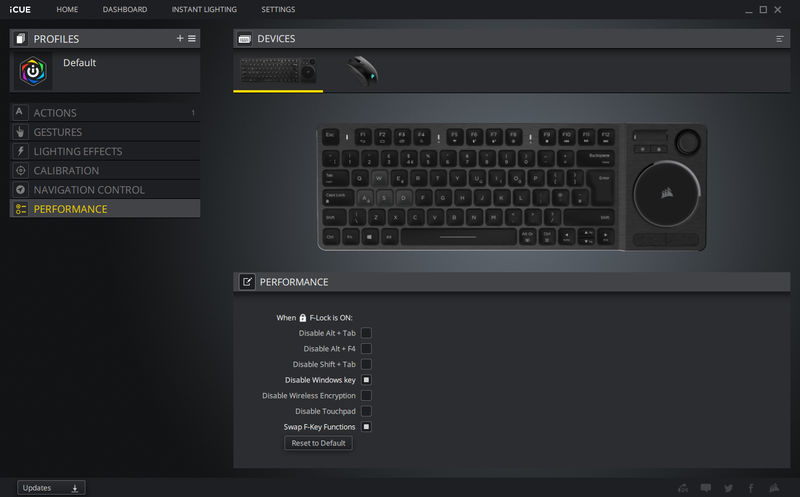 With a $99 retail price, I’m expecting at least £100 to be demanded here, since Corsair seems to base exchange rates on those offered by airports, but if I was the sort of person who already owned a premium living room entertainment setup, I don’t think I’d bat an eyelid at paying that. It’s very well crafted, smart looking, and offers features and functionality that you can’t really get elsewhere, so the award below is deserved. However, readers should note that you definitely don’t need to pay anywhere near this amount of cash for a wireless keyboard and trackpad; others are available for one fifth the cost, so you better make sure you actually will make use of all the extras here before pulling the trigger. This £100 wireless headset pairs solid sound quality and good comfort: a winning combo.